How to NEVER let insomnia beat you. Even when you can not fall asleep. 3. “Terminal Insomina” – Waking too early and being unable to get back to sleep. So I will be posting a more in depth article about how you can slowly rid yourself of chronic onset insomnia problems that are most likely caused by not respecting your circadian rhythm, excessive stress or poor stress management. However, if you are suffering from onset insomnia for other reasons such as pain or suffering from middle or terminal insomnia I implore that you seek professional medical attention to get to the root of your problem. But back to the article, what can you do right now to never let insomnia win and dominate your life? I used to suffer from chronic insomnia, throughout high school and it got even worse as I began college. A lot of my problems with my sleep during high school were due to poor habits. However, during college I made a concerted effort to improve my sleep hygiene and respect my circadian rhythm. Despite my best efforts, whenever I needed a great night of sleep, such as before a big test or track meet, I was unable to achieve that deep and rejuvenating sleep. What was I doing wrong? My major problem underlying all my bouts of insomnia upon introspection was my mentality. I was putting way too much pressure on myself to fall asleep. If I did not fall asleep immediately I would begin to incessantly wonder “what is wrong?” I would begin playing the doomsday scenario how I would fail my test or lose my competition the next day because I was not able to sleep right now! This is absolutely the worst thing you can do. As Sam mentioned in his previous post about mindfulness in motion it is key to accept whatever comes up and not run away from it. The exact same thing applies to what happens to you in life. How you respond to your life events is much more important than what happens. So how can you use this knowledge to never let insomnia beat you? You should never spend more then 20-30 minutes in bed if you can not fall asleep. If you can not fall asleep get up and complete an important task that you may be stressing out about that could be completed in 20-30 minutes. Then once you are completed go to bed. You may respond by “I need to be asleep, I don’t have time for this!” That may be true, but I have found that your body has infinite intelligence. If it is telling you that it has energy you might as well use it. Also, in my personal experience I have found that whenever I get out of bed and complete my task then go back to bed I end up sleeping like a baby afterwards and feeling great in the morning. I hope this article helped give you the tools and knowledge to always beat insomnia! If you have any questions please make a comment below, and if there is any topic you would like me to discuss let me know. Blogs such as these are much more fun and helpful if there is interaction. So please always feel free to reach out to me on facebook or linkedIn (Pavan Mehat) or shoot me an email at pavanmehat12@gmail.com. 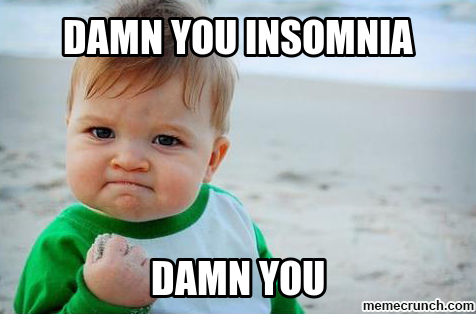 -Your mentality surrounding insomnia is very important in determining the effect it will have on your life. Keep on the look out for a very detailed future post about how to not only cure sleep insomnia but hack your sleep!